If you don't see how all of Scripture points to Jesus, it dwindles down to a collection of moral principles and historical accounts. Two books I've read recently seek to show this main message of Scripture. But they do it in very different ways. Justin Buzzard's The Big Story shows you the forest, while Todd Friel's Jesus Unmasked shows you the trees. Read just Buzzard and you'll miss a lot of beauty and depth. Read just Friel and you'll get confused. Buzzard provides the map of the national park; Friel gives you the botanical guide. The Big Story will help you understand the 'metanarrative' (storyline) of the Bible. Others have outlined this as "Creation-Rebellion-Redemption-Consummation"; Buzzard uses the similar outline of "God-Creation-Rebellion-Rescue-Home". Jesus Unmasked explains how Jesus is the focus of, and the gospel is portrayed in, such stories as Noah's ark, Moses' rock, the tabernacle, the bronze serpent, the sabbath, the seven festivals, to name just a few. Here's a chart to help you see the strengths of both. Quotes from trusted authors, with relatively few direct quotes from the Bible. Both men are good writers and good Bible students. I consider myself fairly familiar with the Bible, but I learned significant things from both books. I seem to have too many books and too few disciples. Consequently I find myself with no one to whom I can give either of these excellent books. Jesus Unmasked would not work for someone from another culture (too many quips that only Westerners would understand). If you, or someone you know, would be interested in a free copy of one or both of these books, please contact me. I purchased Jesus Unmasked, but I received The Big Story for free from Moody Press in exchange for an unbiased review. If you've been a Christian for a while, you have probably experienced the pain of watching the fall of a spiritual leader you once admired. I have written this poem in hopes of helping us process the emotions and respond appropriately. to claw the earth with cries? the flock which was his all? Did his friends think like Cain? And finish His good work? who, like me, had God killed? again to keep his vow? in love with world, leave Paul? entranced with just Your face. A new mother imagining throwing her baby against the wall. A man terrified of driving on odd-numbered streets. A woman with dissociative identity disorder running down the middle of the street in the rain, barefoot. Is the Bible sufficient to help people like these? What about the woman who goes into hysterical shrieking when she enters the kitchen due to flashbacks of childhood abuse? We tend to think that people with severe problems like these need treatment deeper than the Bible discusses. 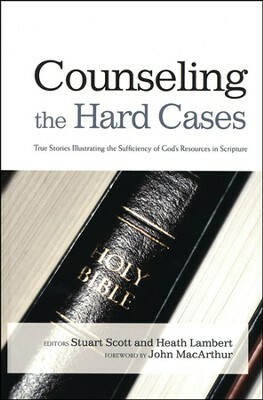 The book Counseling the Hard Cases is a wonderfully encouraging demonstration that God is not dead, and His Word is not inadequate. It contains ten true stories of people with all of the above problems, and many more, who found hope, peace, life, and lasting change through the life, death, and resurrection of Jesus. The ten stories are told by ten different biblical counselors, who explain in detail the problems the people had, and how the Bible spoke to each of them. I have taken over 60 hours of training in biblical counseling and have read a number of books on it, including three by Jay Adams. But I can honestly say that this book was more helpful to me than any of them. It is detailed enough that when you're done you feel like you could help someone with similar problems, yet non-technical enough that you don't get bored or brain-fogged. More than filling your head with knowledge of counseling, this book repeatedly points you toward worship as you see how God rescues people even from the most horrible problems you can imagine. Every pastor and church elder should own and read this book (why not bless yours by giving them copies?). I also would recommend it for any layperson who has psychological problems or who wants to help someone who does. The printed book is rather expensive but the Kindle version is reasonable. I got this book for free, but as a gift from a friend, not the publisher. Did you ever notice that immigrants often have some of the same characteristics necessary to become a follower of Jesus? For the past few months I've had the joy of teaching in our church's English as a Second Language ministry. If you are looking for a way to build relationships with people for the purpose of sharing Jesus with them, ESL/ESOL is a great avenue. If you don't know where to start, the North American Mission Board has a wealth of resources on this page.